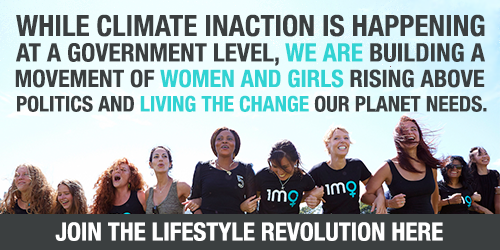 This Year 1 Million Women is turning 10, and we're throwing some huge celebrations. In the lead up, we handpicked and asked a few amazing brands to come on board to be a part of our celebrations as partners. They all do amazing things - but I don't need to tell you that here, because the rest of this blog will tell you why! For many of us, our superannuation is our biggest lifetime investment - it's a huge chunk of money. How would you feel though, if you found out your money was supporting the fossil fuel industry, or even other industries you might be against, like gambling or weapons? Right now, 55% of super funds are investing in fossil fuels, and only 2% are investing in renewable energy. So yep, it's pretty likely that your current superfund could be investing in things you don't like if you haven't looked into it. But the good thing is, it's really easy to change. Switching super funds literally only takes three minutes - this video proves it! Then all you have to do is let your employer know that you've switched. We love Australian Ethical because they invest in things we care about - like a company that keeps plastic nets out of the ocean and turns it into carpet, and of course renewable energy, and they don't invest in fossil fuels. And, they have great returns! This is an important one for us to think about as women. You can read more about it all here. By now, you'll all be familiar with the world's first barista standard reusable cup. In fact, KeepCup is so popular that its' brand name has become the colloquial word for reusable cup. What you may not know is that selling cups aren't their main focus! KeepCup is really driven to create a disposable free world by 2023, to lead the charge to ensure the world no longer needs, wants or uses disposable cups. They're a campaign supported by a product. Did you also know, that after only 24 uses your KeepCup has a lower impact than a disposable cup and the more you re-use the more it keeps saving. For KeepCup, it's not about selling as many cups as possible it's about buying once and buying well. 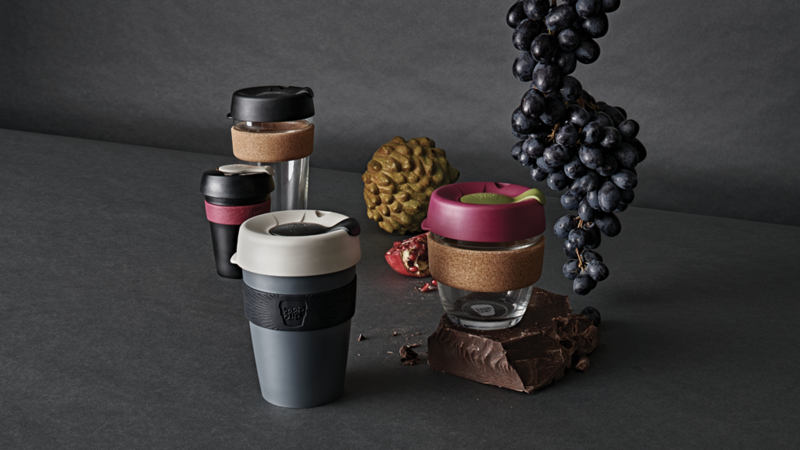 It's all about reusing, so they want you to use what you've already got, so if you've already got a KeepCup, they don't want you to buy another one. This kind of attitude is why we love them. A business working for a solution. One of the most frustrating things is seeing someone at the supermarket checkout with their fruit and veg all in separate plastic bags. The worst! 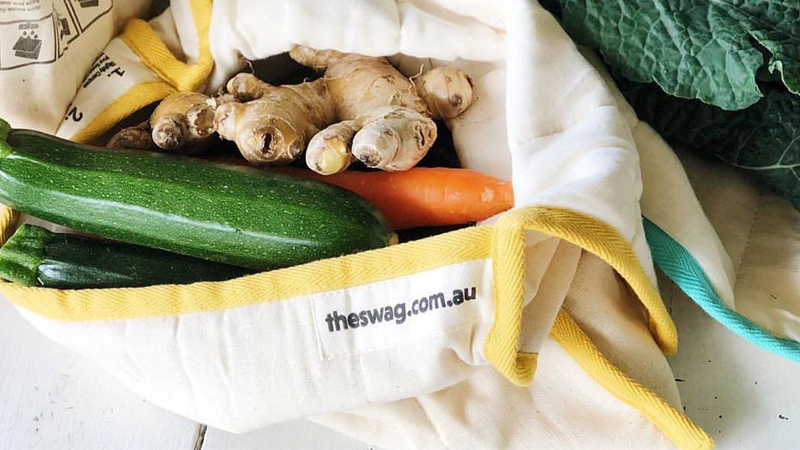 Enter Onya's reusable produce bags. They come in a cute little pack of 5 or 8 bags that all fit together inside a cosy pouch, so they're easy to pack up and have ready for your next shopping trip. 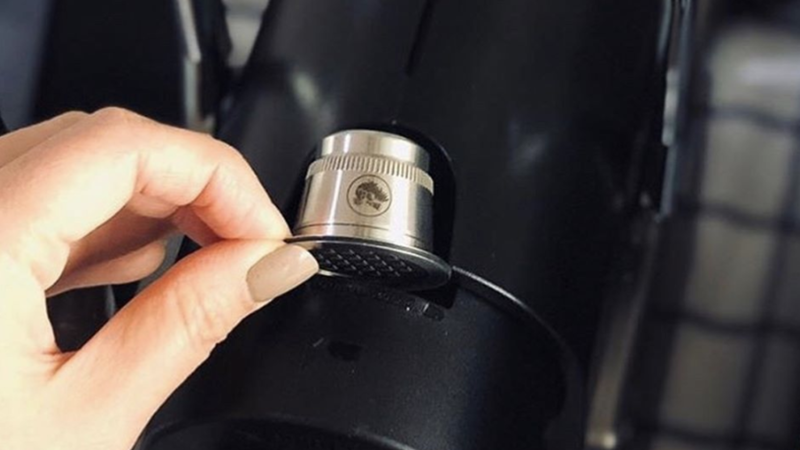 The best part is that Onya's products are made from recycled materials where possible and with the support of their customers, Onya was able to divert over 19.54 tonnes of plastic waste from landfill in 2018 by turning it into reusable single use plastic alternatives. In addition, all of Onya's products are recyclable themselves, you can send them back to them at their end of their long life cycle so that they can go around the circle again! 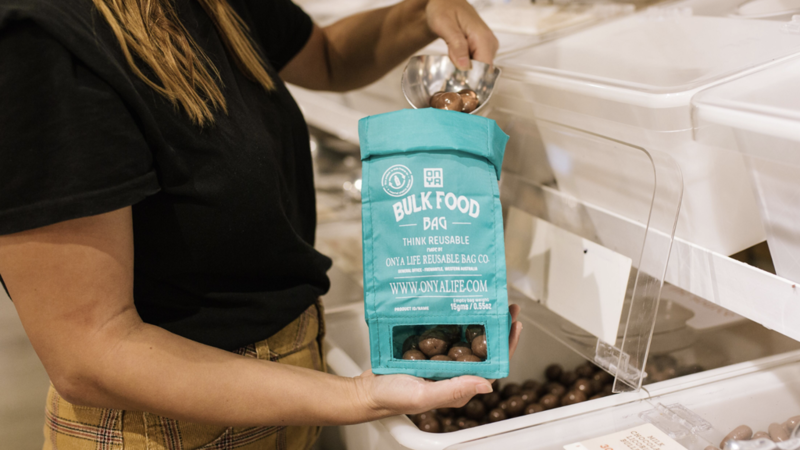 On top of everyone's favourite produce bags, we also really love the bulk food bags and bread bags! Onya is B Corp Certified and their commitment to sustainability extends to their packaging as well. It's made from post-consumer recycled material and printed with water based inks so it is suitable for both recycling or composting. Did you know that in NSW, on average, every landfill bin is at least 1/3 food waste? We're sure you've heard all the food saving measures before - "plan your meals, shop to a list, eat your leftovers, create as little waste as possible" - these are all important factors to save money, food and reduce your footprint on the environment. Sometimes it might all sound like too much effort, but it's worth it. Reducing food waste can save households up to $3,800. That's enough for an adventure, or saving for a rainy day, while keeping our food from ending up in landfill where it generates greenhouse gas emissions. The NSW Environment Protection Authority's Love Food Hate Waste program tackles food waste at home, when out and about and in businesses to ensure we make the most of our food. Love Food Hate waste also partners and supports organisations and other change makers like us to tackle food waste. Share your tips for loving food and hating waste on the Love Food Hate Waste NSW Facebook page, visit their website and visit them at Carriageworks on the 25th of May. Where you put your money matters. The money you put in your bank account is used by banks to make loans. This means the money in your account could be contributing to the very things your against, like fossil fuels, live export and nuclear weapons. 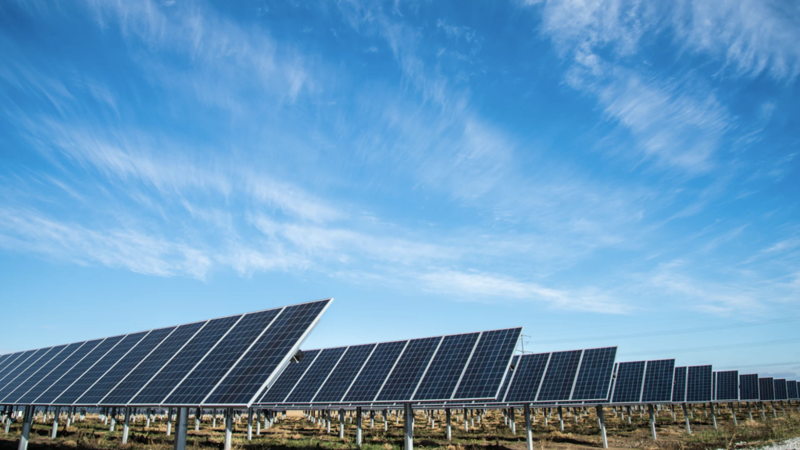 Instead, Bank Australia they will lend to community renewable energy projects and participate in programs to help low-income households put solar on their roofs to ensure that they create positive impact for the planet we all share. Life is so much easier when you have a menstrual cup! Seriously. Every woman to come through our office ends up using them because of how much we rave about them here. A menstrual cup will change. your. life. And keep 9,600 tampons and their plastic coverings out of landfill. 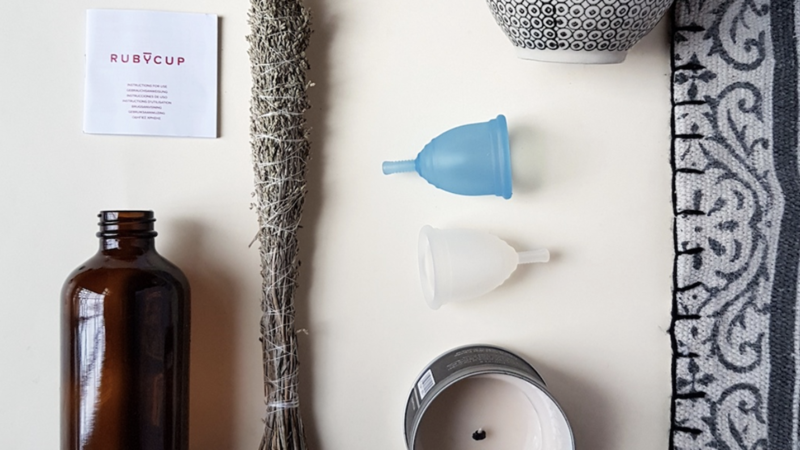 Ruby Cup is our favourite menstrual cup brand because they're realistic about sizing, they're a women led business and best of all, every time you buy a cup, they give one to a girl in a country where good menstrual hygiene products are hard to come by. In the process, they're also working to fight taboos in developing countries where women's menstrual health suffers because it's not a topic that women and girls feel that they can freely talk about. And we can't go past the fact that they're educating girls on how to use a product that's reusable! While we're on the topic of periods, we know that menstrual cups don't work for everyone. So if that's you, Modibodi has the answer! They're a period and leak proof underwear company and they are a dream come true! Their underwear is perfect for so many situations - on light days of your period, if menstrual cups aren't for you, as a back-up to your menstrual cup on heavy days, during maternity, or to protect from light bladder leaks or heavy discharge. And remember how terrifying it was when you first got your period when you were at school? Our 1 Million Women team all wish that period underwear were around when we were teenagers. Instead of having to sneak to the bathroom with pads and tampons in your pocket you just slip on a pair of underwear and away you go! And as far as leaks go, you've got your bases covered. And while menstrual cups are incredible, we know they can take a while to get used to and may be a little intimidating for your very first period. Period underwear are a perfect starting point for people in the first years of their period. In Australia alone, we use an estimated six million coffee pods every day! Not only do these single-use capsules deplete natural resources and increase C02 emissions - the majority end up in places like landfill and our oceans! Crema Joe saw this issue and came up with a solution - a reusable stainless steel coffee pod! So you can still make the perfect brew without the waste. And planet-friendly products isn't all Crema Joe are about. They focus on promoting a circular economy, encouraging consumers to reuse products where possible, all the way down to packaging materials! Instead of buying new, Crema Joe collects and reuses packaging materials from local businesses and individuals, who may have otherwise thrown them out! And when materials likes these are necessary, those items are disposed of or moved forward consciously: rubber bands are passed on to the local post office, and cardboard rolls from tape head to kindergartens for crafting! The Swag tell you that their 100% natural and reusable products will keep fruit and veggies fresh for weeks, and the comment we hear from our friends and family when they first try them is a surprised "WOW, it really does what it says it will". Remember how we talked about how families are wasting thousands of dollars worth of food because it's going off in the fridge before we can cook it up and eat it? A 1 Million Women survey also found that the food people most commonly waste is fruit and veg that just went off. But the thing is, if you've got The Swag, you have WEEKS to get through that food, because while it's safe inside your Swag in your fridge, your veggies will stay crunchy, nutrient rich and happy. It's probably sorcery. Plus, when The Swag finally comes to the end of its life then they're fully compostable with zero impact on the earth or wildlife - double yay! Say buh bye to cling wrap because reusable wax wraps are here! If you haven't seen them before, wax wraps are wax infused natural fabric squares that you can use in your kitchen to wrap food and cover containers. They're easy to use, plastic free and can be composted at the end of their life! Wrappa makes wraps out of beeswax as well as vegan wax. 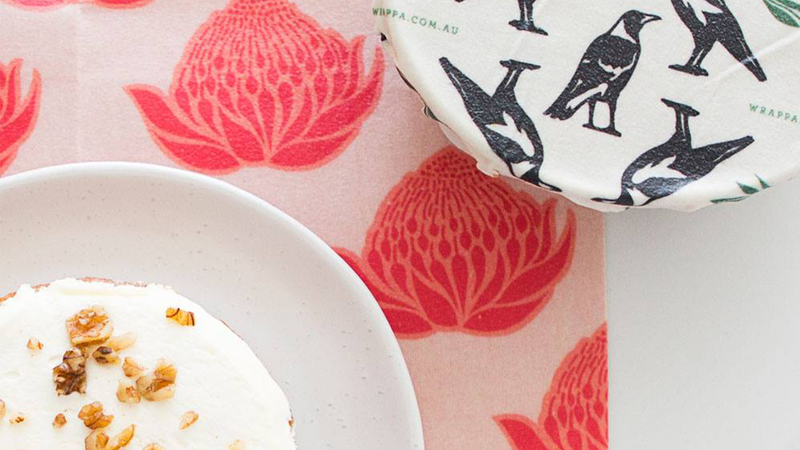 They're made in all different sizes come in some gorgeous prints - from hammerhead sharks to Australiana like waratahs and a magpie print! Harris Farm are our supermarket hero. They have an imperfect picks selection where the 'ugly' fruit and veg gets a place to shine, they work closely with local farmers and focus on local, seasonal produce. They got rid of plastic packaging from their organic range (can I get a woop woop!) and they were the first supermarket in Australia to stop using plastic bags! It's little things like this that make living a planet-friendly life easier for everyday people and it also puts pressure on the big supermarkets (looking at you Woolworths and Coles) to get their act together and follow suit. Harris Farm is truly leading the way and we wish there were more like them! Want to cut your power bill by reducing your energy consumption, outsmart the energy companies to get the best deal on electricity for your household, or get maximum value out of rooftop solar? Wattwatchers helps with all of these, and numerous other home energy challenges, by harnessing the power of data to save you money and cut carbon pollution at the same time. 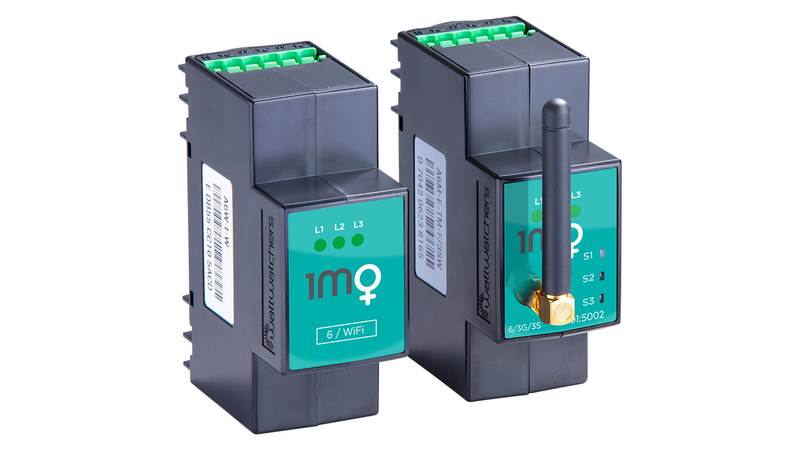 In the Wattwatchers solution, internet-connected smart devices track in real-time how electricity is used for the whole home and for major appliances, empowering people with a choice of energy management apps. You also can remotely control power-hungry appliances like air-conditioning units, hot water systems and pool pumps. This supports you the consumer to change wasteful behaviours and make smarter investments in clean electricity and energy-saving equipment and programs. When Wattwatchers supported 1 Million Women's original 'Women Power' energy saving pilot in 2014, the 10 very different women and households who participated in the 3-month challenge to cut power consumption by 20% smashed the target, averaging 45%. 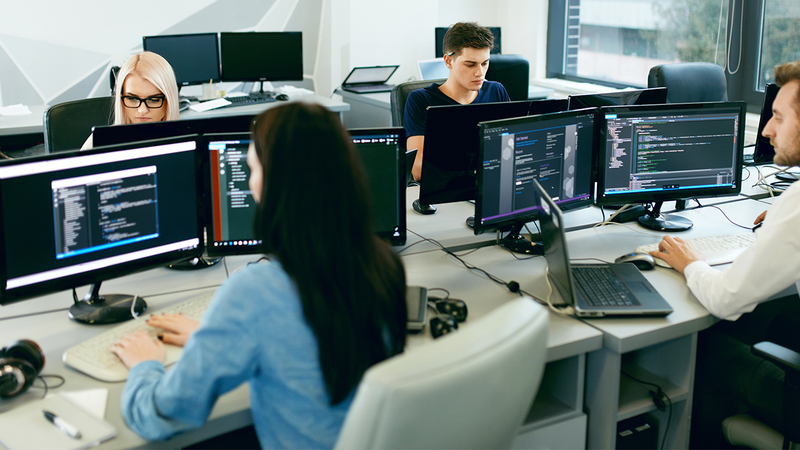 Wattwatchers renewed its partnership with 1 Million Women in 2018 to collaborate on a full-scale rollout of 'Women Power'. Have you ever thought about the emissions the internet produces? Right now, the IT sector produce a huge 11% of the world's total emissions. Everyone always says that data is stored up in the "cloud", but the reality is, there's no cloud. Instead, there's big, hot data centres. Energy is not only used to keep them running, but to cool them, with fans constantly whirring away. So where that energy comes from really matters. And that's where AusTiger comes in. If your website is hosted by AusTiger, it will be 100% carbon neutral - your website will be powered by renewable energy. On top of this, their office has solar panels installed, so their workplace is also powered by 100% renewable energy! Cool huh? AusTiger have helped us out since the very beginning, hosting our website and answering any questions we have. We can't recommend them enough! Guess who makes Bonsoy! Yep, it's these guys. We think this is the best tasting milk alternative out there - some of us in the 1MW office drink it straight it's that yum, but primarily it's the best friend of our tea and coffee. If you've given up dairy because of the emissions associated with it, or even because the reason you care about the environment in the first place is because you love animals, don't think you're doomed to a life of black tea and coffee or even worse, weird watery milky tea and coffee. Because Bonsoy to the rescue. Along with this, Spiral produce heaps of other delish organic foods - so that means no pesticides that are hurting important little pollinators. We love their vinegars and sauces - lots of them are gluten free if that's ever something you struggle to find! Spiral will have a stall at our LoveEarth Festival, so you can check out their product range there. You might find that some of their products are favourites you've already got in your pantry! KPMG have been there for 1 Million Women since the beginning. They know that climate change is one of the greatest risks the world faces, and have accepted their responsibility in addressing the issue through the services they offer, through staff, and through driving positive impacts among the general community. Right now KPMG has a focus on instilling a zero waste mindset amongst staff and beyond. One example of what they're doing, which we're loving, is they've announced that they're going to go disposable cup free by introducing mug libraries and other reusable cup options across all of their cafes and kitchens. We know how huge this is - we've spent some time with staff at KPMG and know that they love their coffee, and they've got plenty of it coming from their in-office cafe. By switching to 100% renewable options, they're saving a massive 250,000 cups from going to landfill every year. Happy International Women's Day from all of us at KPMG! Let's work together to #BalanceForBetter and build an inclusive future for all this #IWD2019. Imagine: An electric car that you can actually afford. Well, we've got good news, this isn't a dream this car actually exists, it's the Nissan LEAF and not only is it affordable, it's also the reigning World Green Car of the Year winner. Electric cars might be the future, but they are available now. Right now, transport is one of the key contributors to emissions in many developed countries, but the switch to electric vehicles plays a big part in how we fix that. Australia's a country with a lot of wide open space, and sometimes the reality is that we need to drive somewhere, whether we're carpooling to a job that's out of the way, or visiting family that aren't connected to any public transport. But Australia is also the world's epicentre of rooftop solar uptake, in fact two million households have rooftop solar. We're one of the sunniest countries in the world, and the idea of powering our cars with sunlight is a real possibility. Not only that, we could also use our electric cars to help solve our solar storage woes. Our cars can store all that energy for us! And guess what, Nissan LEAF can do this (and it's the only EV able to do this)! It's called bi-directional charging and means that the car can store surplus power which can then be used to power your home or business. We're so proud to have Nissan on board because they've been in this from the start. They made the first LEAF in 2009, and like the award suggests, the current model is as good as it gets. It takes about an hour to charge on a fast charger, and we love the idea of the e-pedal, which is a single pedal that controls both acceleration and braking, by accelerating as you press down, and automatically braking when you take your foot off the pedal. For more info, take a look at the Nissan website. This amazing event space is a Sydney icon. The heritage buildings of Carriageworks used to be part of the Eveleigh Railway Workshops that have since been "recycled" and are now a multi-arts centre. Carriageworks is committed to showcasing art and events that reflect a diverse Australia and we can't wait to bring our 10 year celebrations to this space!